X-rays revolutionized dental care in the 20th Century. The same could happen in the 21st Century as cone beam computed tomography (CBCT) becomes a fixture beside the traditional x-ray machine. 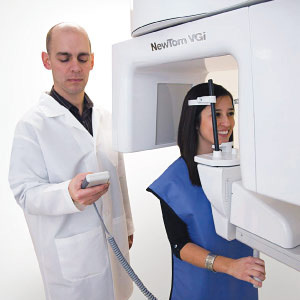 CBCT made its debut in dental offices about a decade and a half ago. It utilizes the same invisible energy as traditional x-rays to create images of the face and jaw. But unlike traditional x-rays, which can only depict structures in the two dimensions of width and height, CBCT can create three-dimensional images in amazing detail. The CBCT's x-ray projector rotates around a patient's head. As it emits a cone-shaped beam of x-rays, the device simultaneously collects anywhere from 150 to 599 distinct image views. It transmits these views to a computer that assembles them into three-dimensional images that can be viewed on a computer display. From the data file of images, dentists can re-format a variety of views and angles of teeth, jaws and other facial bones at various levels of magnification. Because of this wide range of views, all in striking detail, CBCTs are highly useful among other things for diagnosis of malocclusions (bad bites), the size and location of infections, obstructions at possible implant sites, or jaw problems prior to surgery. Because they expose a patient to higher doses of radiation than a standard x-ray machine, they're normally limited to more complex oral situations. That means you'll still undergo standard x-rays for most of your dental treatment needs. CBCT radiation levels are lower, however, than medical CT scans, which use a fan-shaped beam that can expose a patient to ten times the radiation of a CBCT. For dental care, a CBCT machine also produces greater image detail than an MRI. Depending on your needs, CBCT may one day be a part of your dental care.Â With their range and accuracy, it could play a major role in helping you attain good health. Ten Foods That Are Good For Your Teeth! Do You Brush Your Teeth Correctly? Probably Not! Don't Believe Everything You Hear! Why In The World Do You Need To Know That? HALLOWEEN IS SCARIER THAN YOU THINK!!! Football Can Be A Penalty For Your Teeth! UP THE CREEK WITHOUT A DENTIST!! !